In this iMobie wiki page, you will learn more details about Apple AirPods, including its design, features, performance and more. AnyTrans – A Smart Way to Transfer & Manage Contents on iPhone. AnyTrans is a professional iPhone transfer that you can transfer any contents from iPhone to computer. Download AnyTrans and have a try before reading this article. 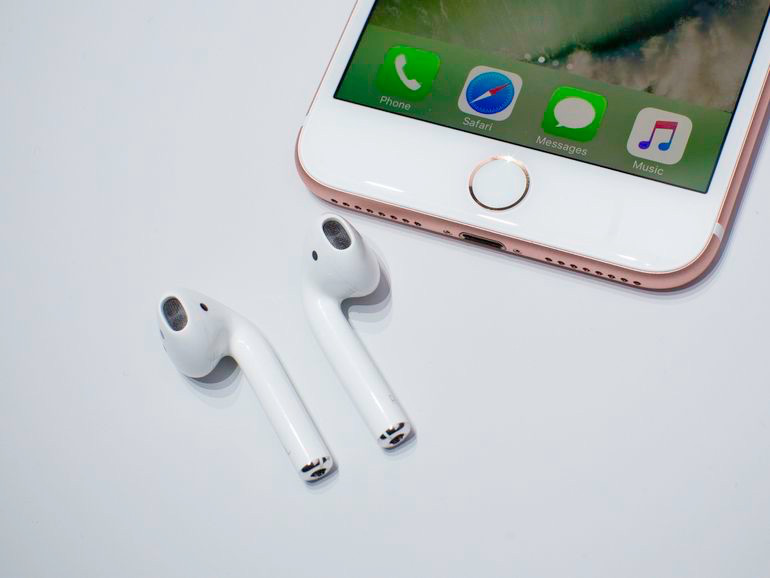 AirPods are new wireless headphones launched by Apple on September 7 along with iPhone 7 and will be available for sale in late October. It is reported that they are already to be used with iPhone, iPad, iPod, Mac and Apple Watch (via iCloud account). The groundbreaking of AirPods is that Apple uses a new custom-designed W1 chip to deliver consistent connectivity, quality audio and solid battery life. A voice accelerometer recognizes when you’re speaking and works with a pair of beamforming microphones to filter out external noise and focus on the sound of your voice. What’s more, built-in optical sensors and accelerometers, AirPods automatically control the audio and engage the microphone, you can use one or both AirPods. It’s great-sounding music (Learn: how to transfer music from iPod to iPhone), movies (Learn: how to transfer movies from iPad to PC), and more to your ears. AirPods provide rich, high-quality AAC audio. And when users want to be heard, dual beamforming microphones filter out background noise when users make calls or talk to Siri. Besides, AirPods connect automatically with all Apple devices. They’re simultaneously connected to Apple users’ iPhone and Apple Watch, and sound switches instantly between the devices. In terms of battery life, AirPods deliver an industry-leading 5 hours of listening time on one charge. And they’re made to keep up with you, thanks to a charging case that holds multiple additional charges for more than 24 hours of listening time. Need a quick charge? Just 15 minutes in the case gives you 3 hours of listening time. To check the battery, users can hold the AirPods next to them and ask Siri "How’s the battery on my AirPods?"